The Dharma Journeys Pilgrimages are open to all. Good health and a serious interest in Tibetan Buddhism are appropriate for a fulfilling experience. Himalayan High Treks coordinates the logistics and administration for the Dharma Journeys programs. This page presents administrative and registration details. Please visit the Dharma Journeys Website for Dharma Journeys program descriptions and background information. 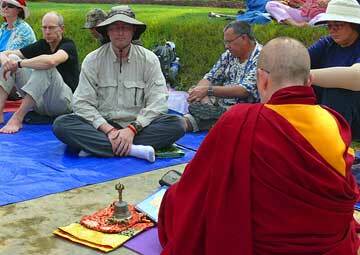 Dharma teachings and group meditation sessions. An English–speaking local guide accompanies the group to assist the program and its pilgrims. 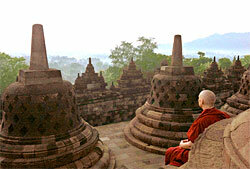 Indonesia: Borobudur. India: Sravasti, Kushinagar, Nalanda, Vaishali, Vulture's Peak, Bodhgaya and Sarnath. Nepal: Boudhanath, Swayambunath, Parping, Kapilavastu, Lumbini & much more! 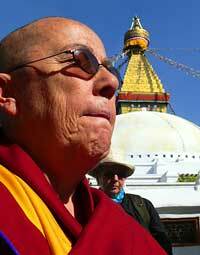 Venerable Robina Courtin was ordained as a Tibetan Buddhist nun at Kopan Monastery, Nepal in 1978. 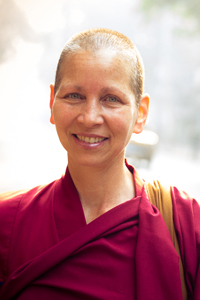 She has since worked for Lama Thubten Yeshe and Lama Zopa Rinpoche's Foundation for the Preservation of the Mahayana Tradition, as editorial director of Wisdom Publications and later as editor of the FPMT magazine, Mandala. Since 1987 Ven. 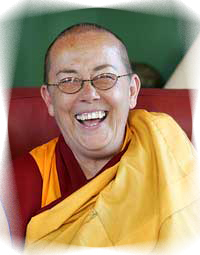 Robina has taught Buddhist courses and retreats at FPMT centers worldwide. An award-winning film by her nephew Amiel Courtin- Wilson, "Chasing Buddha" documents her life and work at Kentucky State Prison. She is one of the subjects of Vicki Mackenzie's "Why Buddhism?,"
and a film by Christine Lundberg, "On the Road Home." She is a popular and engaging pilgrimage leader. We start with a meditation retreat, led by Ven. Robina, at Kopan Monastery, the monastery of her lamas. We then visit the holy sites of Kathmandu Valley — Boudhanath, Swayambhunath and Parping — before continuing to India. Ven. Robina will give Dharma teachings and lead pujas and meditation sessions at each pilgrimage place, based on the advice of Lama Zopa Rinpoche. The pilgrimage is authentic: in India, we trace the actual steps of the Buddha. "People are so moved by the experience; it always amazes me. Going to these holy places touches people deeply, transforms them,"
Lawudo is a remote retreat center in the Mount Everest (Solu Khumbu) region of Nepal. It is a sacred place built around a small cave in which the Lawudo Lama meditated in the 1930s and 1940s. He was said to have attained high realizations there. The current reincarnation of the Lawudo Lama is Kyabje Lama Zopa Rinpoche, the Spiritual Director of the Foundation for the Preservation of the Mahayana Tradition (FPMT). Rinpoche advised Ven. Amy to teach there whenever possible. He stated "It's the most important thing you can do for the WORLD!" This pilgrimage to Lawudo with Ven. Amy will allow you to enjoy the stunning scenery and a challenging trekking experience while also receiving teachings, having a short retreat and visiting some of the holy places in the area. Follow in the footsteps of the great Atisha and his guru Serlingpa, who visited Borobudur, on the island of Java, in the tenth century. The largest stupa in the world, it was buried for 500 years, rediscovered in the 19th century, and restored with the support of UNESCO in the 1970s. There will be daily teachings, meditations and time at the stupa. The monument guides pilgrims through a system of stairways and corridors with 1,460 narrative relief panels along the walls and walkways and 504 Buddha statues. The central dome is surrounded by 72 Buddha statues, each seated inside a perforated stupa. It is the world's largest Buddhist temple and one of the great Buddhist monuments. are necessary to operate this pilgrimage. Passport; Visa(s); Physicians Visit; Emergency Medical & Evacuation Insurance; Travel to Nepal; Meals Beyond Above Itinerary; Beverages; Spending/Personal Money. Mild: Accommodations are most often in comfortable guest houses and four–star hotels. Activities are usually mild and can include day hikes of less than four hours in length. Vehicle time can include fatigue with long travel along rough roads. Pilgrimage costs are based on a typical group size of at least 20 participants. Should this trip be undersubscribed, a surcharge of $200-300 USD per person will apply. This surcharge will be added upon registration and will be removed once/if the threshold of 20 participants is reached. A minimum of 10 participants are necessary to operate this pilgrimage. Moderate: Usually involves hiking an average of four to six hours each day - with some trekking time being spent at high altitude. Accommodations consist of evenings spent at tea or guest houses. are necessary to operate this retreat. Passport; Visa(s); Physicians Visit; Emergency Medical & Evacuation Insurance; Travel to Borobudur; Meals Beyond Published Itinerary; Beverages; Spending/Personal Money.